This entry was originally posted Christmas 2008. I think it deserves an annual repeat. Santa- the life size painted, cut out version- has been an important part of Christmas for as long as I can remember. 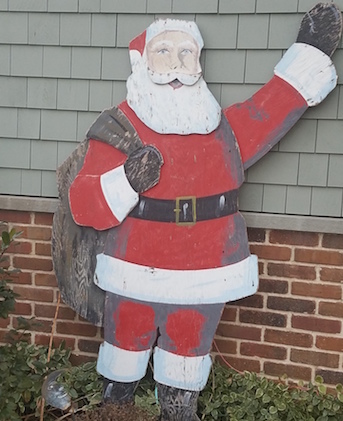 Santa began his life of service in the early 1960’s at my parents’ first house in Avalon. He was surrounded by big, multi-colored bulbs on the newly planted shrubs. Inside that modest Golden Home rancher, 4 little girls hung their stockings on a cardboard fireplace with a plug in red bulb that magically turned the metal wheel to create “fire” . 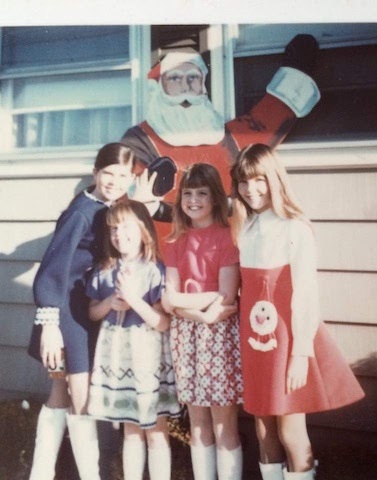 In the 1970’s, Santa moved with our family 5 blocks south in Avalon to a larger, 2 story home with a real wood fireplace. The colorful exterior lights were eventually replaced with more subtle white bulbs, but the spot light literally remained on Santa. In the off season, Santa hung proudly on the garage wall- watching us all come and go. Those little girls grew up and moved out, bringing back grandchildren for days on the beach. In the 1980’s, my young sons were fascinated by Santa, and maybe a bit intimidated based on our attempts to use him for improved behavior! When my parents downsized to a townhouse in the early 1990’s, my father asked if I wanted Santa for our home. Of course, I was thrilled- and Santa didn’t complain as he was forced to leave Avalon and move “off shore”. Santa loyally followed us on each move- knowing that he would be given a prominent position (with a flood light) at Christmas. Several years ago, he gratefully moved back to the island to become a Stone Harbor resident! thought about asking an artist to do a “touch up”, but it just doesn’t seem right. It’s good to remember that so much time has passed- it helps us to celebrate the journey. I loved the story, great writing! !